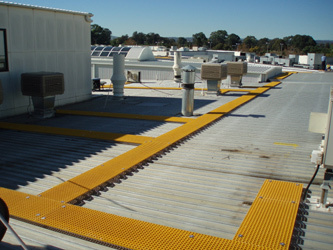 RIS moulded fibreglass grating is made of a composite of resin and continuous glass fibre strand and is an excellent alternative to conventional aluminium and metal flooring systems due to the inherent properties of the product which provide a unique combination of strength, flexibility, chemical ad corrosion resistance, fire resistance, non-conductivity and other highly regarded safety features. RIS moulded fibreglass grating has a weight ratio of one fourth that of steel grating and two thirds that of aluminium grating. This high strength to weight ratio allows for ease of handling, simplifies the installation process and results in lower installation costs. An added benefit is the ability to cut the product on site without leaving any unsightly metal swarf. RIS moulded fibreglass grating has excellent flexibility and impact resistance. The square mesh construction provides bi-directional strength and ensures the product can take significant loads without permanent deformation. As such is an ideal product for heavy pedestrian or industrial traffic. RIS moulded fibreglass is manufactured using an isophthalic resin system that provides excellent chemical and corrosion resistance to most common chemicals and environmental conditions. The combination of an isophthalic resin resistant to chemicals and corrosion and the blending of pigments and UV protection throughout the grating ensure that the RIS moulded fibreglass grating will not require painting and will be virtually a maintenance-free walkway system. The in-built paint pigment also ensures that the product can have a high visibility which can be ideal as a designated walkway pathway. RIS moulded fibreglass grating is supplied with a tough quartz grit surface finish that ensures superior slip resistance even in wet conditions and compares very favourably to traditional steel or aluminium grated walkway systems. RIS moulded figreglass grating has excellent electrical insulation properties and can be used safely in electrical environments. Also, it will not generate sparks when subject to impact from tools or equipment. RIS moulded fibreglass is impervious to electromagnetic interference and will not interfere with radio transmissions. RIS moulded fibreglass has been manufactured to exhibit a minimum of a Class 1 flame spread rating when tested in accordance with ASTM E-84 flame spread Tunnel Test. RIS moulded fibreglass grating standard walkway panel size is nominal 610mm x 2924mm with a square mesh (bar spacing 38mm x 38mm) of 20mm thickness. Open area (ie. air flow, light penetration) which is approximately 70%-80%. RIS is Australia’s largest Height Safety provider, with a National branch infrastructure to meet its client’s needs anywhere within Australia or overseas. With the market place becoming increasingly aware of the need for employee protection when working at heights, RIS is ideally positioned to provide local and overseas industries with practical solutions for any height safety, confined space or rope access application. The company has over 20 years experience within the Height Safety and Fall Protection Industry and we pride ourselves as having the best people in the business for advice, service and workmanship. RIS employs in excess of 70 people and with branches in Sydney, Melbourne, Adelaide, Brisbane, Canberra, Hobart, Darwin and Mackay. With a wide national and international distribution network, we pride ourselves on the most practical, cost effective and compliant fall protection, confined space or rope access systems in Australia and overseas. As such RIS is truly able to provide the Complete Height Safety Solution – a fully integrated approach to the management of height safety and the protection of people when working at any height. 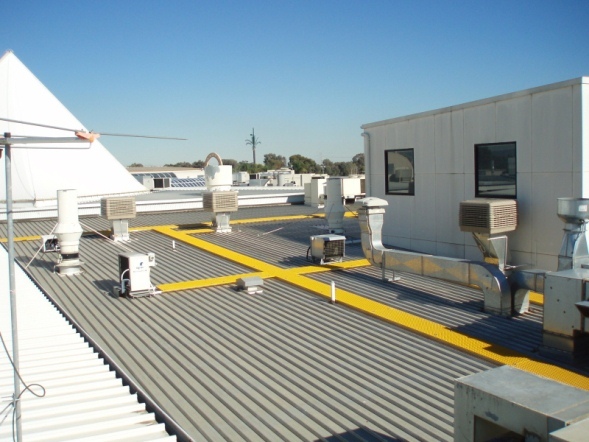 Mention IndustrySearch so Roofsafe Industrial Safety can best assist you! Get a callback from an expert at Roofsafe Industrial Safety to help answer your questions.